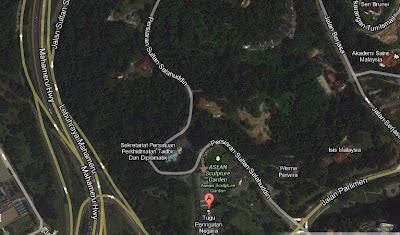 APANAMA: Khazanah wants the National Monument too? 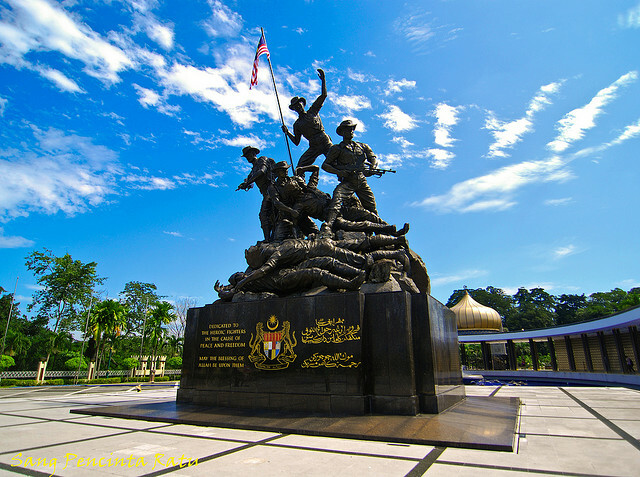 Gambaran artis projek Malaysia Truly Asia Attraction yang akan dibina di kawasan berhampiran Tugu Peringatan Negara, Kuala Lumpur. Anak syarikat riadah dan pelancongan Khazanah Nasional Bhd, Themed Attractions and Resorts Sdn Bhd, akan memajukan sebuah lagi ikon pelancongan negara iaitu, Malaysia Truly Asia Attraction di kawasan berhampiran Tugu Peringatan Negara dan Padang Merbok di Kuala Lumpur. Berkeluasan 26.3 hektar, ia bakal menjadi tarikan pelancongan dan budaya bersepadu bertaraf dunia yang menawarkan pengalaman menyeluruh merangkumi semua budaya dan daya tarikan utama negara. 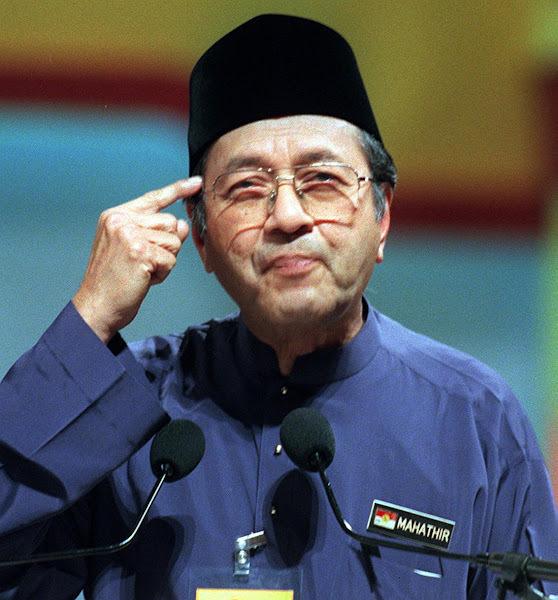 Ketua Eksekutifnya, Tunku Datuk Ahmad Burhanuddin, berkata pihaknya sudah mendapatkan kelulusan daripada pihak berkuasa bagi projek itu dan kini dalam proses mengambilalih kawasan berkenaan. Katanya, pembangunannya dijangka akan dimulakan pada akhir tahun ini dan ia dijadualkan dibuka menjelang akhir 2016. “Apabila siap kelak ia akan menjadi satu lagi tumpuan pelancong asing yang utama di Kuala Lumpur, kerana mereka hanya perlu menghabiskan antara tiga hingga empat jam untuk melihat keseluruhan budaya dan tarikan yang ada di Malaysia. “Kawasan projek terletak strategik di pusat bandaraya dan kami akan mengekalkan kehijauan di kawasan itu kerana ia berhampiran dengan Taman Tasik Perdana dan Tugu Peringatan Negara,” katanya ketika ditemui selepas majlis pengumuman penyertaan empat lagi peserta industri di Taman Tema KidZania Kuala Lumpur, semalam. 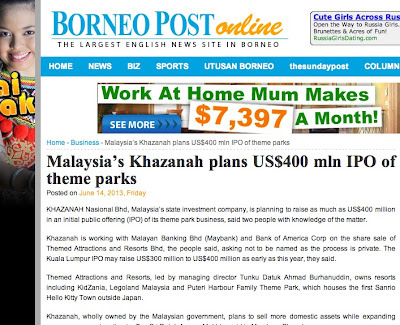 The BH report above is undoubtedly another of Khazanah's long list of shocking news. Its something absurd like the MAS-AirAsia merger drama not so long ago. Its something like the former US President George Bush's 'shock and awe' approach when he was going after the Saddam's yet-to-be-found WMD in Iraq. Khazanah owned Themed Attractions and Resorts Sdn Bhd has basically been given the green light (that is what the chief executive claims) to develop (I read it as destroy) approximately 26.3 hectares of the last remaining greens in the heart of Kuala Lumpur. 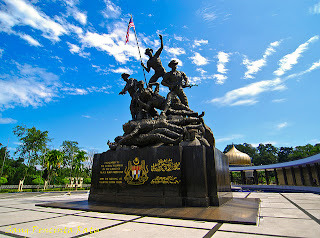 The said piece of land is a heritage around our National Monument (Tugu Negara). But why would Khazanah or rather a Khazanah owned company which is being prepared to be sold in the open market be given this piece of strategic land to 'develop' a Malaysia Truly Asia Attraction? What is a Malaysia Truly Asia Attraction by the way? A theme park, fun fair or just another of the circus where strategic land is flipped many times over till it ends up in some foreigners hands? WTH does this - The Malaysia Truly Asia Attraction is envisioned to be a world class integrated culture and tourism attraction showcasing the best of Malaysia in an innovative and entertaining style. The attraction would consist of immersive and compelling experiences that would provide the visitor a snapshot of Malaysia's rich and diverse offerings. - mean? What could be Khazanah's next target, the Malaysian Parliament House which is less than a kilometre away from this Malaysia Truly Asia Attraction? p/s I'm reminded of previous attempts to rob strategic land from IJN, UM and the landing rights for Sime Darby owned Labu. Why Not? After Sungei Besi Airport the next best thing is the Monument Area. With Najib Nothing is Sacred. and I agree with anon Friday, June 21, 2013 7:33:00 PM "With Najib Nothing is Sacred." A typical Malaysian Developer's mentality " TAK BOLEH TENGOK TANAH LAPANG TERUS AMBIL CALCULATOR KIRA BERAPA TAPAK TU BOLEH DAPAT GROSS DEVELOPMENT VALUE'". ANYWAY AS ALREADY KNOWN, NOTHING IS IMPOSSIBLE IN THIS COUNTRY, SOME ARE EVEN WILLING TO SELL THIER OWN MOTHER INORDER NAK JADI KAYA. 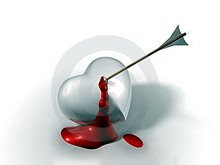 THE ONLY THING YOU CANNOT DO HERE IS TO BRING THE DEAD ALIVE. HERE NOBODY CARES ABOUT THE ENVIROMENT, GREEN LUNGS, PARKS AND PLAYING FIELDS IN THE CITIES AND SUBURBS. THE INTEREST IS TO MAKE TONS OF EASY MONEY AT EVERY OPPORTUNITY REGARDLESS OF THE PUBLIC INTEREST. "MALAYSIA, THE LAND OF ENDLESS POSSIBILITIES", AS TOUTED BY A VVIP IN ONE THE ADVERTISEMENT TO ATTRACT FDI INTO THE COUNTRY. I CRY FOR YOU MALAYSIA. GOD PLEASE SAVE MY BELOVED COUNTRY AS I HAVE NO WHERE ELSE TO GO. Bukan ke kawasan tu bakal gazet sebagai Green Lung? Banyak projek lain pun dah tak boleh jalan situ. .. I thought I was the only one being alarmed by the news! Glad that a lot of people feel the same way! .. Khazanah dah gila ke? Theme-park in KL few remaining green-lungs? LEAVE THE LANDS ALONE!! Is it necessary? We want tourist to spend more time (& money ) not compress 3-4 days into 3-4 hours. 21 acres??? Include spill overs development like luxury condo as part of land swap partnership ???? Will dig out for you. Y don't they develop elsewhere? KL is congested as it is now. Heard that Bukit Perdana is taken over by BNM to develop a financial university. Another green lung going up the smoke. Khazanah should venture abroad. 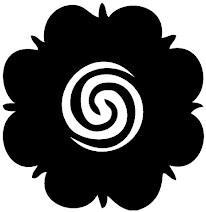 Like USA or South America. That's how you unlock value for our sovereign fund. Don't just take anything that already belongs to the government (and by extension, the public). Why is Najib still keeping all the old guards of Khazanah? ANOTHER GOOD REASON TO REALLY VOTE THE BN OUT NEXT ELECTION. Desecrate our historical sites. Somebody's making lots and lots of money, eh? IS Najib blind? Or he has some interest in all Khazanah dodgy business? Yes, I heard ISIS got the eviction order late last year or early this year. I wonder if Najib knows about this project at all. Even if some developers don't care about the historical value of the PM's grandpa's old house, Malaysians should. It's time we respect our own heritage. 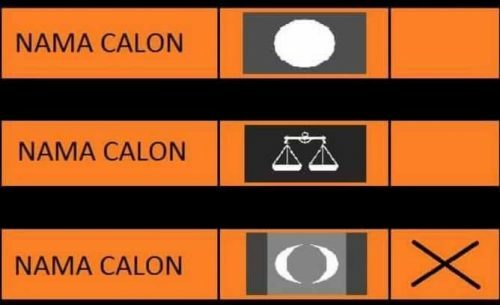 macam ni Khazanah operate? buat duit? 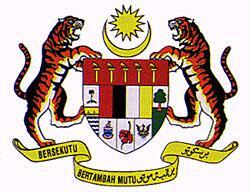 I pun boleh run Khazanah....develop prime land in the Klang Valley, including historical sites. MALAYSIANS -- regardless of your poitical beliefs and affiliations -- OPPOSE this. Awas Najib -- the mammoth protest in Turkey's takzim square started from a small protest against development of a park. Najib and Nazir are the biggest robber barons UMNO have had. These two are just economic sociopaths. Najib will say anything to get power and pass on the booties to his brother Nazir to plunder. BOD members or CEO of GLCs who object are simply transfered or made into a one term senator. These two belong in jail. this is what happen when u the malay bos put people from many races in Khazanah but not from your own race MALAY. the same thing happen in BAM. what ever bad things happen, u will answer Amokh but whatever benefits khazanah got, goes to others races. what a stupid bosses.